Where Should I Camp in Death Valley? Death Valley has 12 campgrounds—nine operated by the park service as well as three private campgrounds. With the exception of Furnace Creek Campground in the heart of Death Valley, all park service campgrounds are first-come, first-served. Furnace Creek accepts reservations through recreation.gov. For holiday periods in winter and spring, be sure to make reservations or arrive early to get a site. Don’t expect shady campsites strewn with pine needles. You might get a scrap of shade from a mesquite tree, but for the most part, Death Valley campsites are open and exposed. The exceptions are the two high-country campgrounds in the Panamint Mountains—Thorndike and Mahogany Flat. But those campground require high clearance and sometime four-wheel drive to reach. When to camp is also an important consideration. Click here for our advice about when to visit Death Valley. And if you’d like to spend some nights in the comfort of a lodge room, click here for our advice about where to stay in Death Valley. Here’s our rundown of campgrounds in Death Valley National Park. All are open year-round unless otherwise noted. For more details, see the camping page on the park’s website. A secluded site in Texas Spring Campground, Death Valley National Park. These campgrounds are near Furnace Creek, which has full services including gas and a general store, as well as the park visitor center. They are well situated for exploring the park in any direction. Furnace Creek—136 sites with water and flush toilets. The campground nearest the park visitor center. Also near general store and all Furnace Creek services. Texas Spring—92 sites with water and flush toilets. Feels quiet and removed, in a hilly badlands landscape across the road from Furnace Creek Ranch. Near general store and all Furnace Creek services. Sunset—270 sites with water and flush toilets. Directly across the road from Furnace Creek Ranch. Open October 15 to May 1. Near general store and all Furnace Creek services. Furnace Creek RV Resort (private)—26 RV sites with water, flush toilets, showers, and full hookups. Adjacent to Furnace Creek Ranch and general store. Bonuses: free wi-fi, and short walk to swimming pool. Fiddler’s Campground (private)—35 RV sites. Must be self-contained; no water or toilets. Adjacent to park visitor center and near general store and all Furnace Creek services. Bonuses: free wi-fi, and short walk to swimming pool. 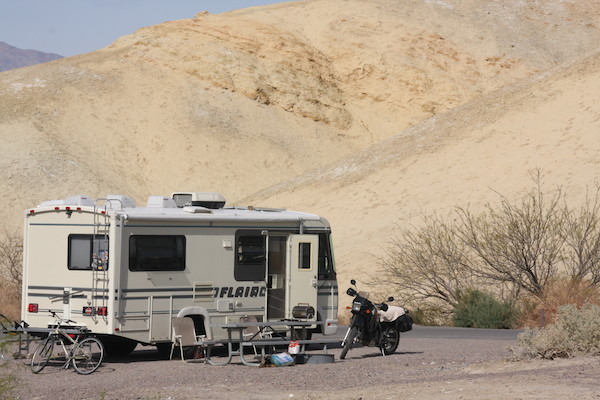 Death Valley’s western campgrounds are found along Highway 190 and in the Panamint Mountains. Three of these campgrounds are on Highway 190—Stovepipe Wells, Emigrant, and Panamint Springs. Stovepipe Wells is about a half hour from Furnace Creek; Emigrant, about 40 minutes; Panamint Springs, about an hour. The campgrounds in the Panamints—Wildrose, Thorndike, and Mahogany Flat—are an hour and a half to two hours from Furnace Creek. These campgrounds have no services. You can access the high-country campgrounds by following Emigrant Canyon Road south from Highway 190. Stovepipe Wells—190 sites with water and flush toilets, and gas station nearby. Short walk to general store and restaurant. On Highway 190. Emigrant—10 sites for tents only with water and flush toilets. On Highway 190. Panamint Springs (private)—63 sites with water, flush toilets, and showers, including 12 sites with full hookups for RVs and gas station nearby. Short walk to general store and restaurant. On Highway 190. Wildrose—23 sites with water and pit toilets. At 4,100 feet in the Panamint Mountains, it’s a cooler option when the valley floor is baking. Thorndike—6 sites with pit toilets, no water. At 7,400 feet in the Panamints, surrounded by pinyon pines. Open March through November. Much cooler than valley floor. Requires high-clearance vehicle and sometimes four-wheel drive, depending on road conditions. Mahogany Flat—10 sites with pit toilets, no water. At 8,200 feet in the Panamints, surrounded by pinyon pines, great views of Death Valley. Open March through November. Much cooler than valley floor. Requires high-clearance vehicle and sometimes four-wheel drive, depending on road conditions. Death Valley has one campground in the northern part of the park, about a 15-minute drive from Scotty’s Castle and about an hour and 15 minutes north of Furnace Creek. Mesquite Spring—30 sites with water and flush toilets. Quiet, secluded feeling, yet near Scotty’s Castle and Ubehebe Crater. No matter where you camp in Death Valley, you can count on Just Ahead to guide you to the park and to all the great sights within its 3.4 million acres. 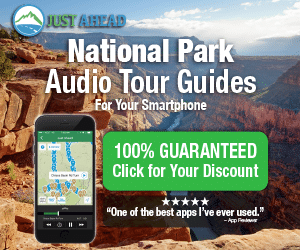 Our app turns your smartphone into an audio tour guide that narrates everything you’re seeing along the way. It’s the best way to get the most from your visit. Click here to try Just Ahead for free.